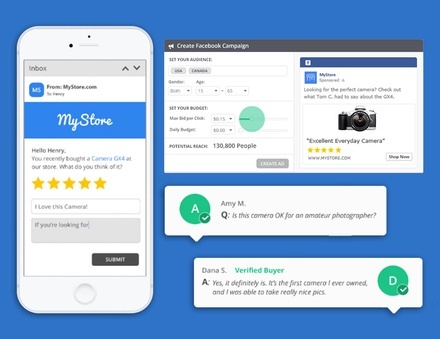 Get authentic customer reviews the smart way. Make user-generated content your most powerful marketing tool. Rise to the top of search results with ratings and reviews. Yotpo is a social review system that gives your shoppers a great experience of both reading and writing reviews. Yotpo’s built in powerful features help you generate a lot of traffic and increases social engagement with absolutely no effort. Collect more ratings and reviews by giving your customers a beautiful, simple, mobile-first reviewing experience. Harness the trust of past buyers to turn visitors into shoppers, and see an instant uplift in conversions. Seamlessly distribute reviews over social platforms so you can share the love and acquire more traffic. Enhance your organic traffic and the performance of your paid search ads with Google Seller Ratings, Google Product Listing Ads and organic SEO tools. Loyal customers cost less and spend more. Engage them with retention tools that keep them coming back.